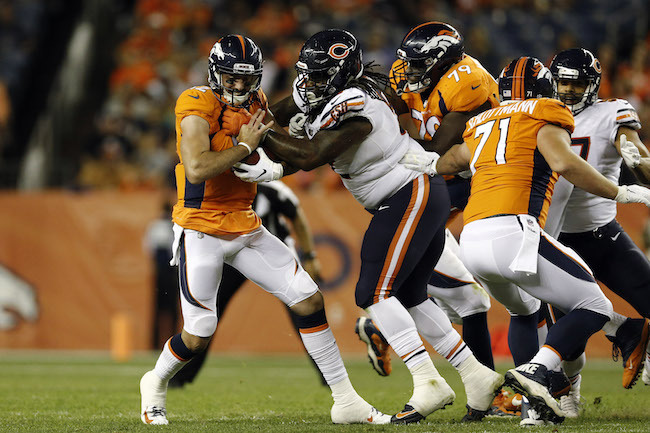 The New York Giants have signed nose tackle John Jenkins, who was cut by the Chicago Bears on Saturday. The 29-year old, 6’3”, 327-pound Jenkins was originally drafted in the 3rd round of the 2013 NFL Draft by the New Orleans Saints. He has spent time with the Saints (2013-2016), Seattle Seahawks (2016), and Bears (2017-2018). From 2013 to 2015, Jenkins played in 42 regular-season games with 21 starts. However, in 2016 and 2017, Jenkins played in just 17 regular-season games with two starts. He was inactive for eight games in 2017. With only 1.5 career sacks, Jenkins is strictly a run-defending nose tackle-type. To make room for Jenkins, the Giants waived linebacker Romeo Okwara. The Giants originally signed Okwara as an undrafted free agent defensive end after the 2016 NFL Draft. Okwara played in every game in 2016 with four regular-season starts. He played in the first five games of the 2017 season before being placed on Injured Reserve in October with a knee injury. He was activated off of IR in December but did not play again. The New York Giants filled their last remaining vacancy on the team’s 10-man Practice Squad on Tuesday by re-signing defensive end Josh Banks, who was waived from the 53-man roster on Sunday. Banks was originally signed by the Giants as an undrafted rookie free agent after the 2017 NFL Draft. He spent his rookie season on Injured Reserve with a shoulder injury (torn labrum). The players return to practice on Wednesday.